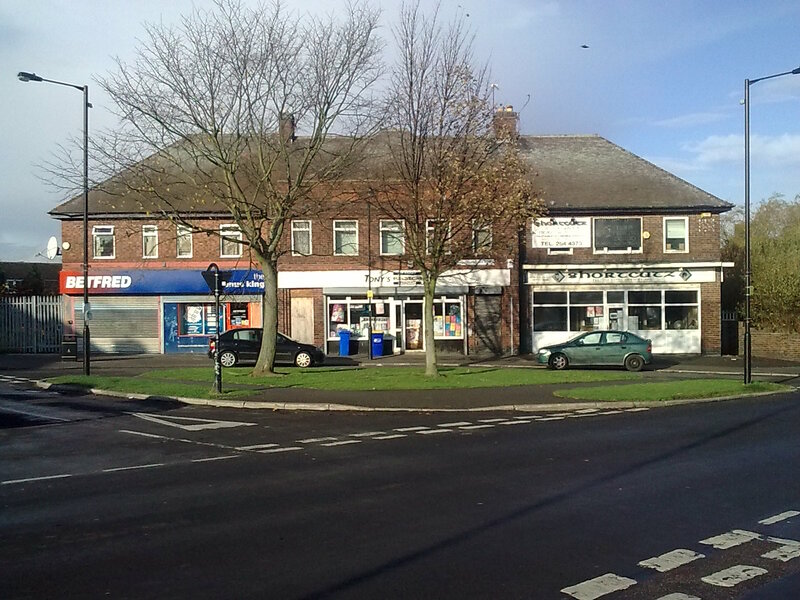 If you live on the Arbourthorne the most convenient shops are those located on Northern Avenue. It would be a longer walk up to Manor Top or a bus ride into town if these shops were not there. 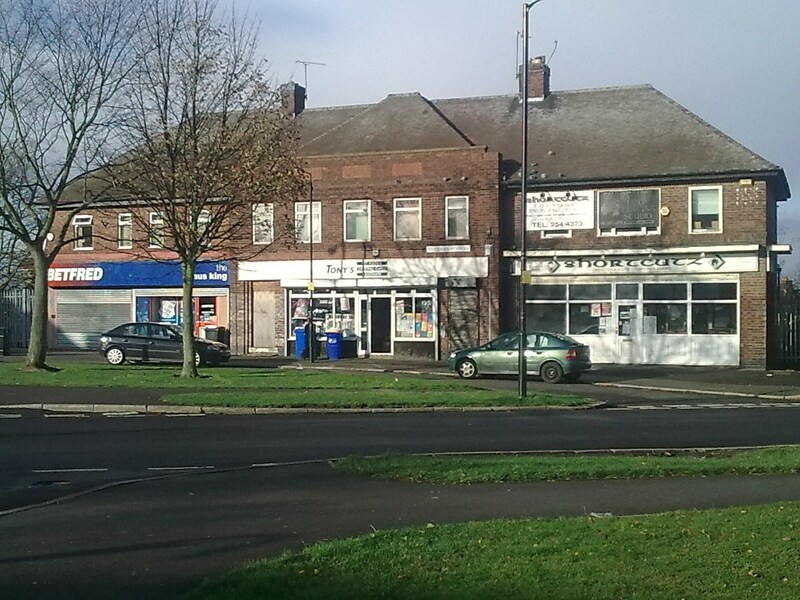 Built around a small circular road for access at the point where Cawdor Road and Northern Avenue cross, these local shops have provided a service to this local community for many years. A Pizza Plaza, this used to be a flower shop. Lloyds Chemist, always been a chemists but not always Lloyds. Very handy for prescriptions if your doctor is at northern Avenue surgery just up the road. My old Junior school mate Stephen Herbert used to live in the flat above this chemists shop. I used to be a newspaper boy at this shop. My mother worked there for many years. Now a sandwich bar and a Premier convenience store this quarter has much more history to it. The sandwich bar and the first bit of the convenience store was once a butchers and a car spares shop. There was a fire (arson) one night which burnt out both these shops. 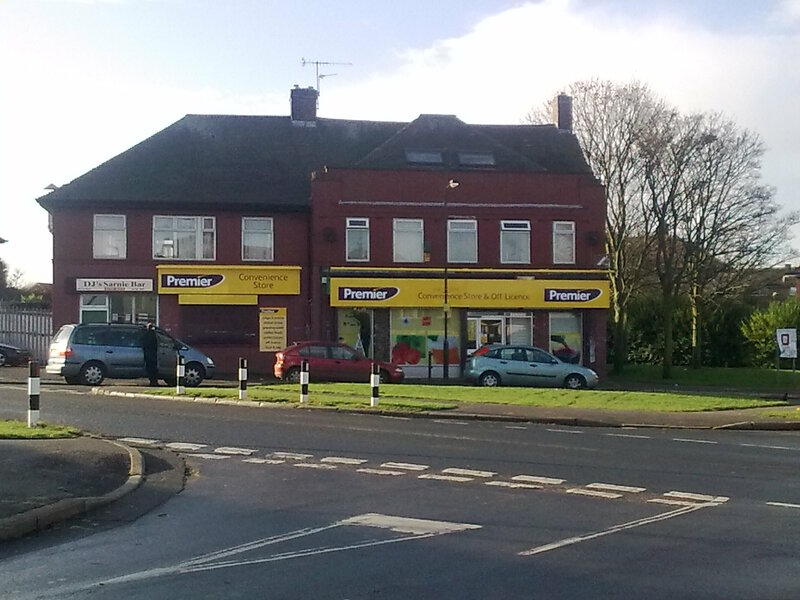 The car parts shop never reopened so its now part of the store to the right and the butchers became the sandwich shop. In the early 1970's I used to deliver papers to the butchers / sandwich shop and you had to go up a rickets set of external steps to get to the flat above the shop which had a garden on part of the shop roof where it was extended and only 1 storey high. The convenience store was originally a walk through fruit and veg shop with cowboy salloon gates and sawdust on the floor (like the butchers also did). When this finished the business was taken over by a Pakistani family who continued the business for many years turning it from just a fruit and veg shop into a small supermarket to rival the Co Op across the road. as SALLS STORE it probably did more trade than the the Co Op and, like many Asian run shops it had long opening hours, - you could buy almost anything at any time at a reasonable price. It has now become, as already mentioned, a Premier convenience store. Strangely, the last shop on the right of this block seems to be missing, - the whole building just doesn't look symetrical, - and its not that the other end has been extended as it still looks wrong at the side of the buildings in the other 3 quadrants. I can't honestly remember why or what used to be there. Currently Bet Fred- a betting shop, Sun King- a Chinese food outlet, Toni's- a general store and Shortcutz- a hairdressers. Bet Fred has always been a betting shop in my memory but I can remember building work being done to make it a betting shop. No idea what it was before. notice the fencing to the far left of the pictures for security. I also have a vague recollection that the betting shop, as well as being Ladbrookes at one time was also once called Cliff Richards , but I'm not a gambling man. 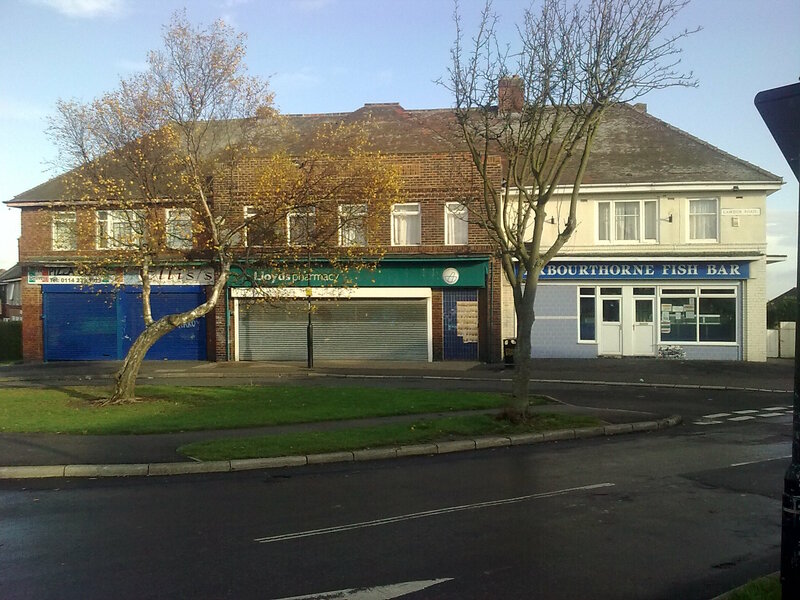 The other shops on this site have been a Fine Fare supermarket, a pet shop and a grocers in their time. The current Shotcutz used to be a smaller hairdressers in the next quadrant next to the chemists / florists. 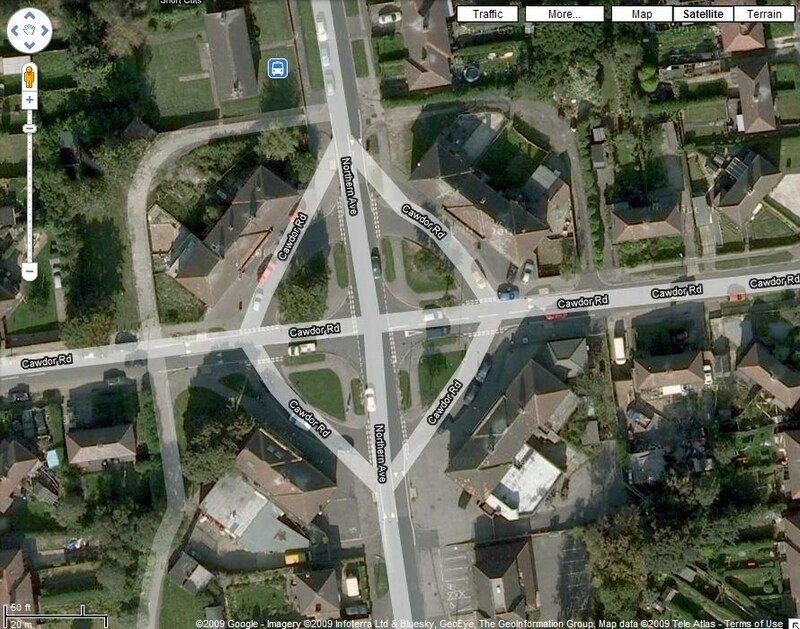 These are the addresses I would have expected but interestingly that circle of road they are built on is given by Google maps as Cawdor Road, - the road which crosses Northern Avenue at right angles to create those 4 quadrants. 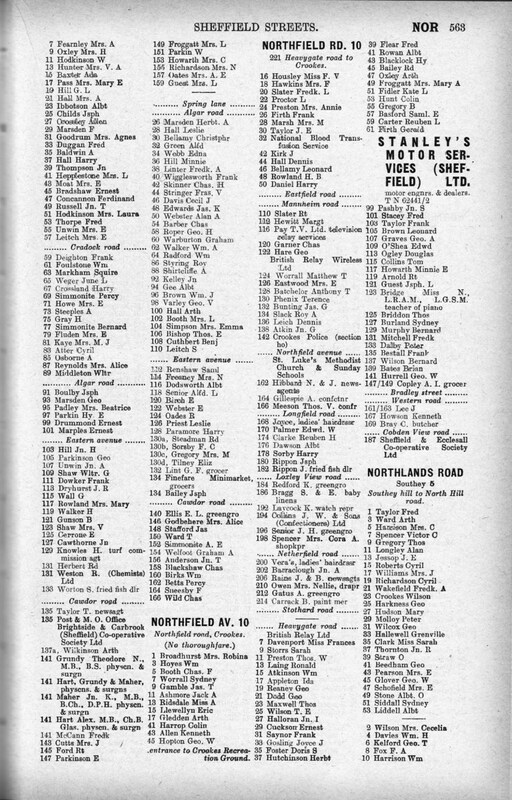 Yes, There was another betting shop (Knowles) where the florist later appeared. The chemist was Westons, it was called that when my mate Stephen Herbert lived there. Stephen passed his 11+ and went to Concorde Park Grammar School but Stuart0742 may remember his younger sister Diane Herbert who went to Norfolk. Wortons the fish dealers was actually Arbourthorne chip shop, -it was staffed by the same 2 women for years. T. Taylor the newsagent was where I did my paper round, Mrs. Taylor was the postmistress. 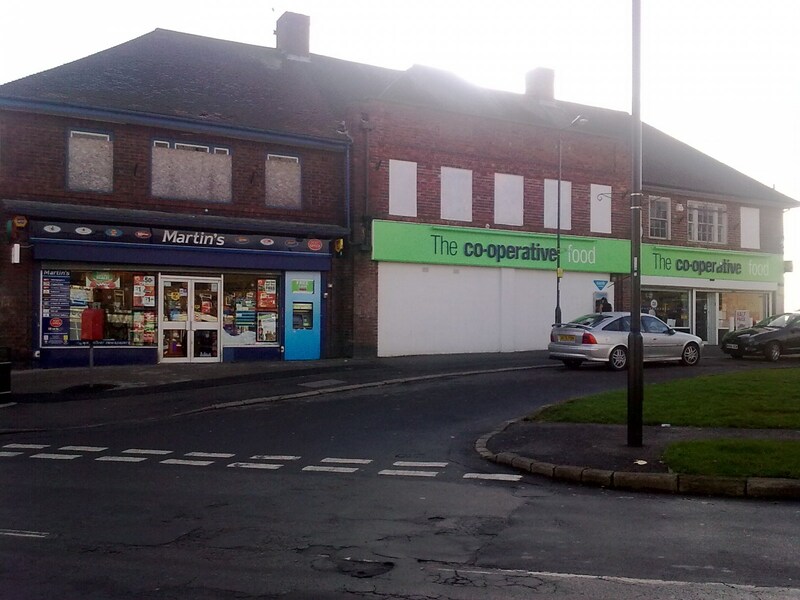 Of course the Co - Op was where my mum worked, - the "B&C"
The place I delivered the papers up that rickety stairway to the rooftop garden was Ellis's. The place I delivered the papers up that rickety stairway to the rooftop garden was Lints. 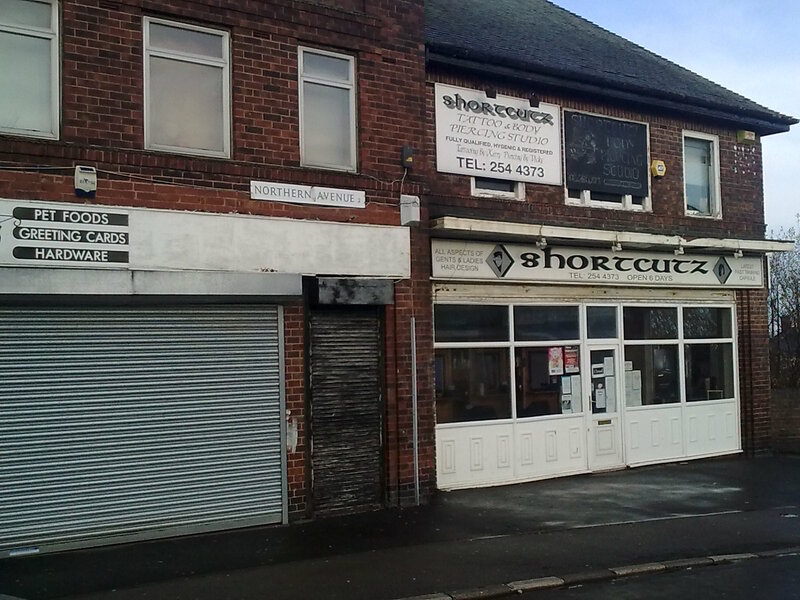 I think I can remember Shortcutz being a haberdashery shop at some stage, because I once bought an embroidery picture from there and they also used to sell wool and wool patterns, but not quite sure when this was. I am ashamed to say I still have the embroidery picture, only a quarter completed! So, by printing the whole page, with all of Northern Avenue from 1971 on you can see that a load of people we went to Norfolk School with lived on Northern Avenue. No. 65, Mrs J. Weger. Her son Robert went with us on that Science Fair 1971 thing at Granville College because he had done a brilliant CSE science project about the 1969 Moon landings and had written to NASA and got a load of stuff sent back. Both the science fair and the "Jervis quiz" I have referred to before in other threads, - it just never occured to me that Robert weger was with us. As my immediate family is predominantly male it was probably the least used or visited shop in the entire centre. I don't remember the cross stich stuff, although they would have had it but I remember their shop window was like Wendolenes in the Wallace and Grommit film "A close shave", - it was full of balls of different coloured wool and loads of old Sirdar knitting patterns which had partially faded through being left in the window so long. The Herbert family moved to Sheffield in 1964 from Blackpool and that's when I first met Stephen as he was put in our class at Junior school. I don't know why or how they came to live above a chemists shop but I think their mother may have worked there. I don't remember ever seeing or meeting their father. I went through Junior school with Stephen and he chose to take his 11+ exam, I opted out. Having passed his 11+ he went to Concorde Park school, -a strange choice as it was way across the other side of town, - but that's what he did. I met Stuart0742, who did not go to Norfolk Juniors, on our first day at secondary school so I don't think Stuart ever met him. Last time I saw him was around 1970 but I met some people who had been to school with him at University and they told me he had gone into some sort of IT / computer work. Diane was a few years younger than me and Stuart and as the 11+ was phased out the year after us (which is why we had an opt out option) she was just sent to Norfolk secondary. We never really had much to do with her other than knowing who she was. We had the odd girlfriend in her year who was a friend of hers but that was it. Not saying more as I don't think Stuart was very happy about that Cooke's garage on City Road post I did a month or so back. Due to the age difference Diane would still have been at Norfolk when we left so I have bno idea what happened to her after leaving school. Northern Avenue shopping centre has, for the last few years had its own display of Christmas lights which we have called the "Arbourthorne lights". Not very many but enough to make it look different. but having said that it is still only November! So what is their address? We have always referred to these shops as "Northern Avenue shopping centre"
To make matters worse, there are 2 street signs in the centre. The one in the north east quadrant above the chip shop clearly states Cawdor Road. So which one is right? The actual roads cross in the middle and there are no buildings on either road in this section, - just on the smaller circular road that links them. 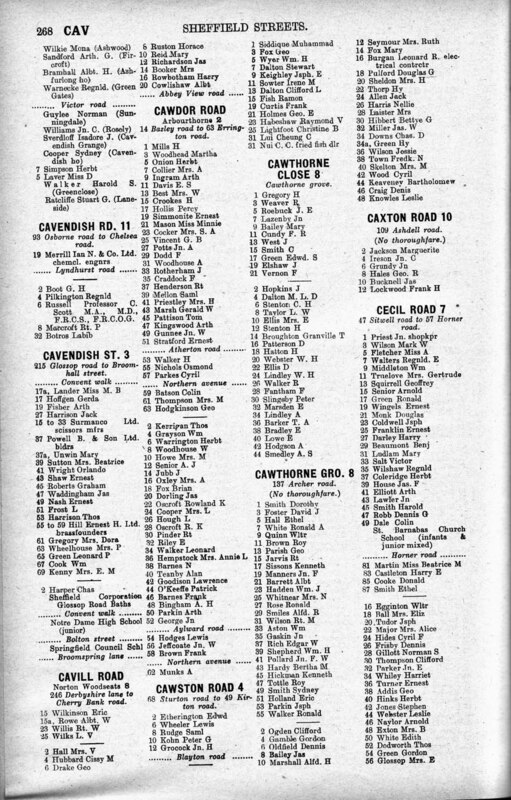 Stuart may want to look up Cawdor Road in the Kelly's directory to see if that gives anything away about any other shops. Diane Herbert was a friend of mine and I used to go to her house when they lived over the Chemist. It was a bit scary late at night going round the back of the shops to get to the entrance to her house. Often wondered what happended to her and the family? 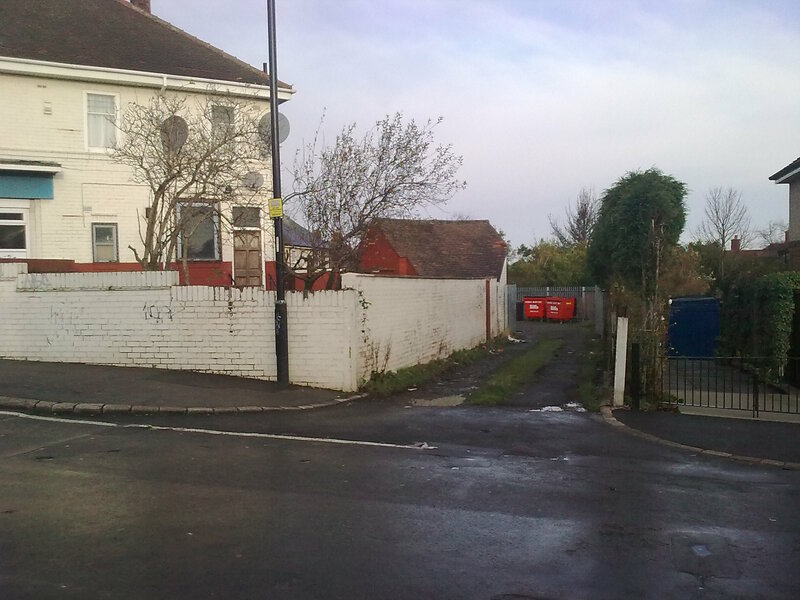 Here is that back entrance Suzy, where it emerges onto Cawdor Road around the side of the chip shop. This pathway, wide enough for 1 car in 1 direction was intended as a delivery road with access to private parking for the flats above the shops. But as you say, they were scarey at night and were a gathering point for trouble and crime. 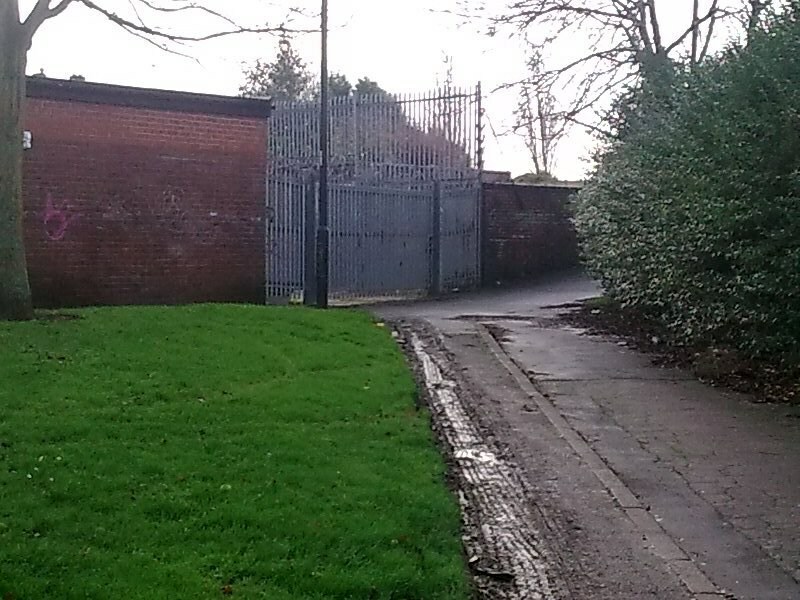 Notice that this particular one is blocked off by security fencing which is always locked. 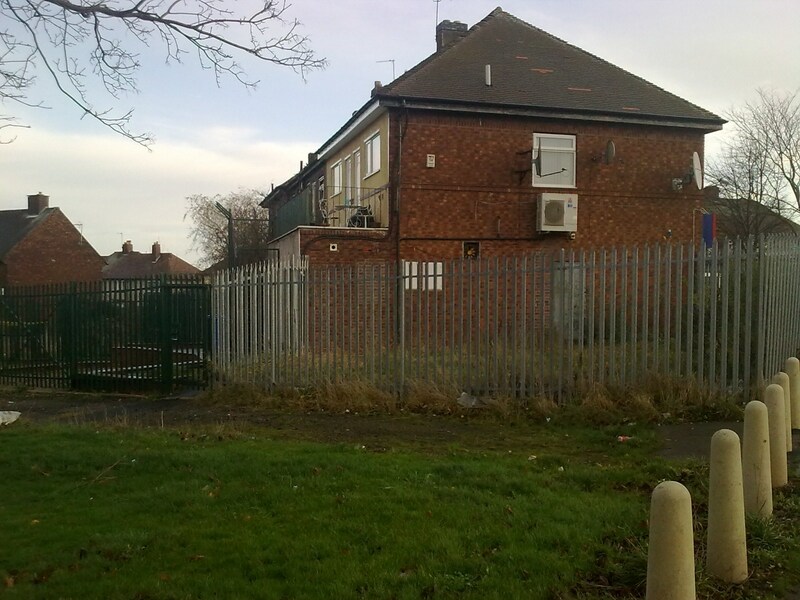 It goes behind the newsagents, post office and Co - Op supermarket. They were always getting broken into at night to steal cigarettes, alcoholic drinks and valuables from the Post Office so eventually it was closed off. 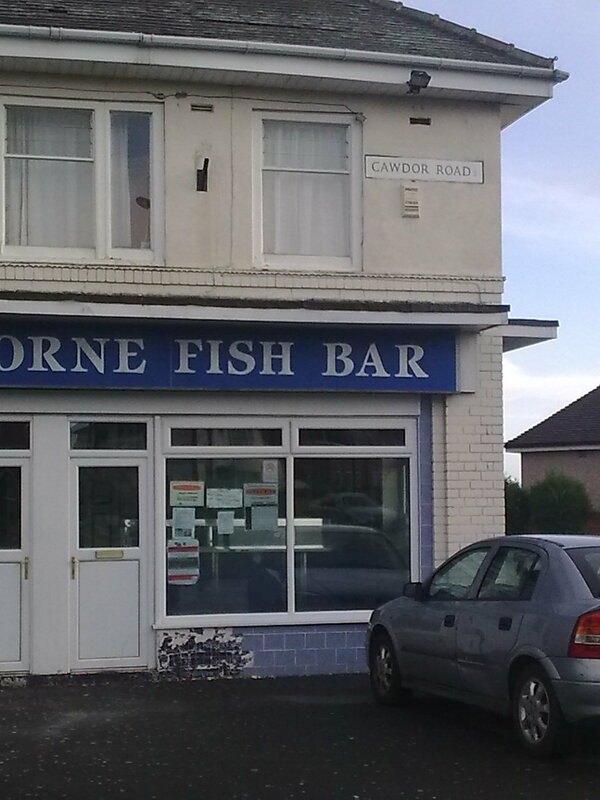 Still doesn't explain that Cawdor Road sign on the chip shop, although due its position it is nearer Cawdor Road than Northern Avenue. The one which goes behind the SW quarter is also blocked off and diverted up the field created where the maisonettes have been demolished. This is the "Salls Store" end, the other end, now rebuilt after the fire, was where I delivered papers up a rickety old metal staircase. 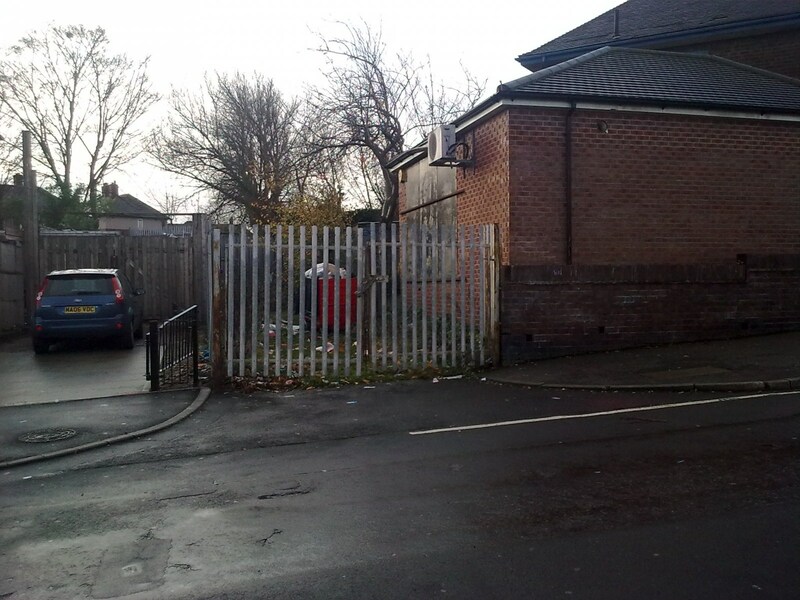 The NW quarter is blocked off with concrete bollards and there is also security fencing around the shop. Well it is a betting shop and so at times there will be large sums of money on the premises, they probably need this level of security. 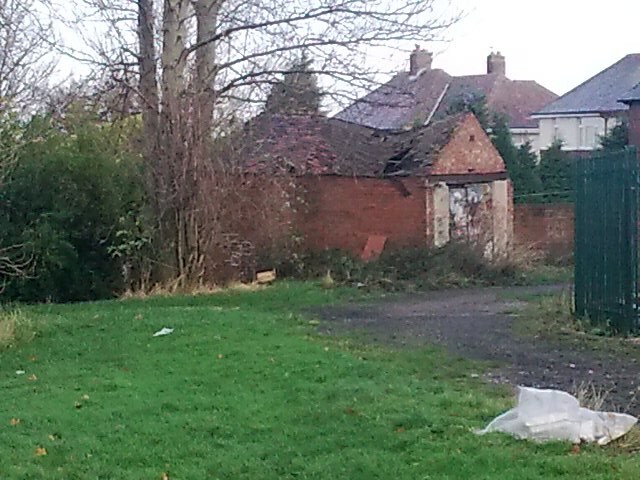 Probably due to high levels of crime and vandalism this private garage which is "round the back" of the NW quadrant was abandoned a long time ago.